Hi peeps! Welcome to SugarPea Designs Fall Release day 5. Today, all the fun sets and dies that you've been seeing all week long are available at the store. And last but not least. 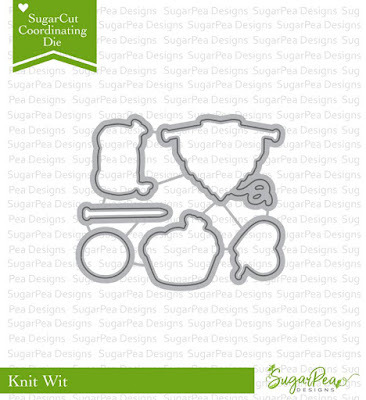 Today we're showcasing this super fun & cute free incentive set called Knit Wit. I think this set is the sweetest, cutest knit set out there. 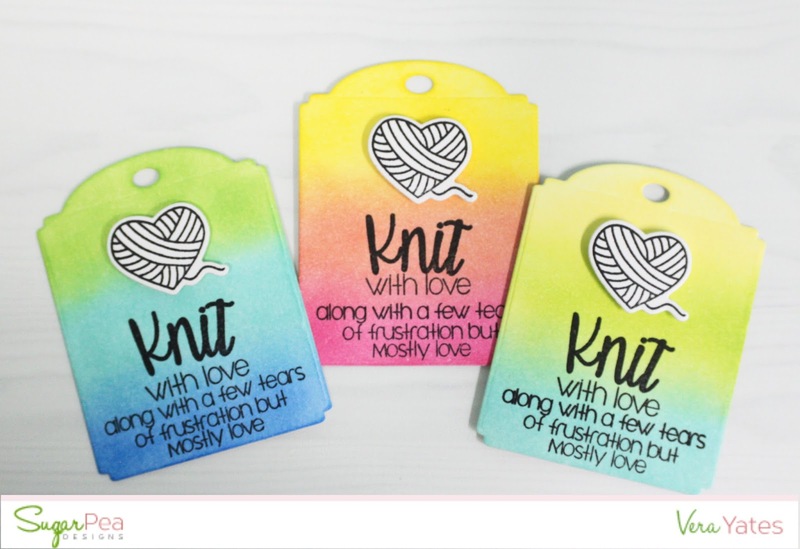 This knit heart is one of my favorite. Well, I also love the spool of yarn since you can add the smiley or the winking face to it. 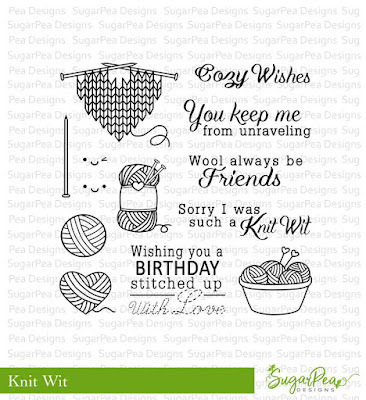 Would you like to win the Knit Wit stamp set? Leave a comment on SugarPea blog and here of course. It’s that easy! You have all week to comment! Winners will be announced on Monday, August 28th. For all my friend that live in Texas coast please stay safe as Harvey landed. Hi y'all! How you've been enjoying SugarPea fall release? Lots of fun set, right? 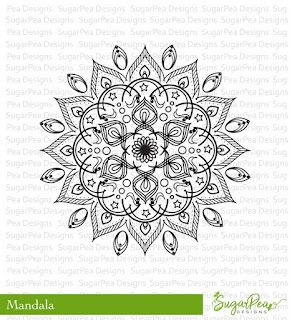 Today we are introducing the beautiful Mandala, Sweet Sentiment - You and SugarCuts You. I am always a fan of Mandala design and find this one gorgeous . I stamped and heat embossed the Mandala with white embossing powder and then blend in some ink following the circle pattern. I then cut out the circle and adhere to the card base. 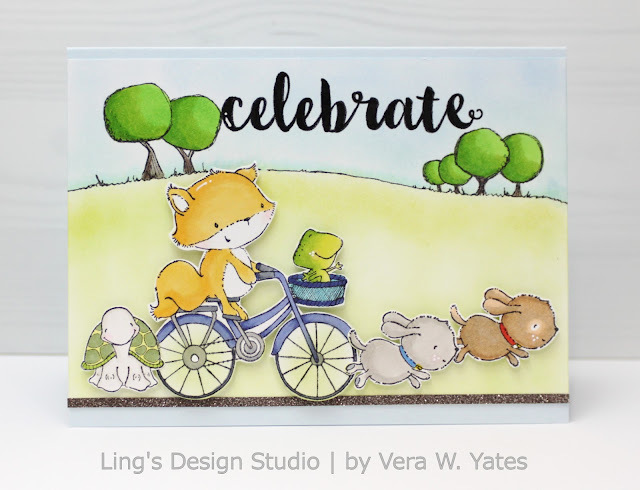 Added a strip of patterned paper and then I stamped the word "You" directly on the circle panel and the card base. Finished by adding the wishing and the best birthday ever. Here's a look at the new sets. The entire Fall Product Release will be available for purchase on Friday, August 25th at 6PM EST. 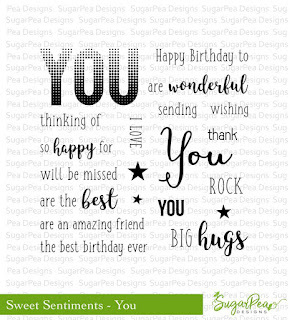 Don’t forget to leave a comment on SugarPea blog for your chance to win the Sweet Sentiments set. We’d love to hear what you think about all of the products that we are showcased today. 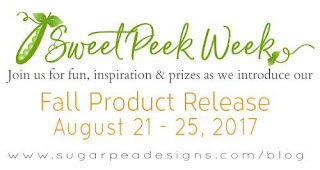 The SugarPea team has created some fun and amazing inspiration for you using the products featured here today. Please visit each of their blog below for details on their projects. And while you’re there be sure to leave a sweet comment for them, giving you an extra entry to win today’s giveaway prize.Thank you for stopping by here & may your day be a blessed one. Hi peeps. It's day 3 of SugarPea Designs Fall release. 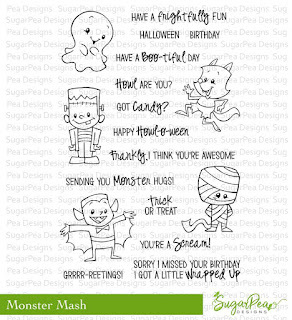 Today, we have a super adorable Halloween set to introduce, called Monster Mash. And let me just say it has the cutest ghost in the block!! I mean seriously, this ghost has such a cheeky sweet smile that makes me think of sweet Casper. How cute are the ghost companion? That mummy.... adorable! And, notice the background? 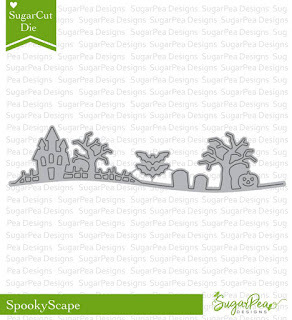 It's courtesy of the super fun Spooky Scape. I simply blend in several distress ink and then sprayed it with some water to create the speckle look. Oh, and I cut a circle mask and ink it with yellow ink for the moon. 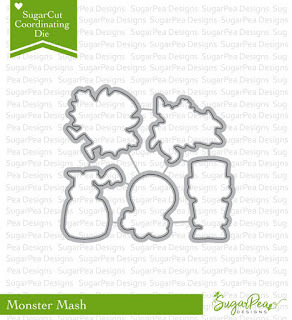 Don’t forget to leave a comment on SugarPea blog for your chance to win the Monster Mash set. We’d love to hear what you think about all of the products that we are showcased today. 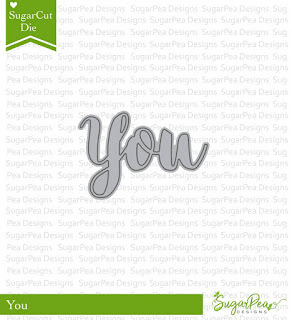 Hi peeps and welcome to day 2 of SugarPea Designs Fall Release. 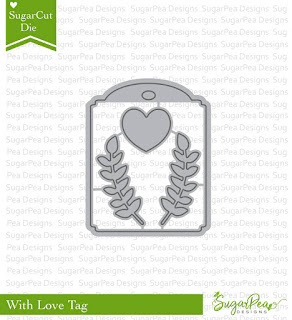 Today we're introducing Made With Love set and With Love Tag dies. 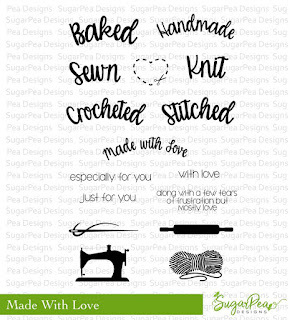 Don’t forget to leave a comment on SugarPea blog for your chance to win the Made With Love set. We’d love to hear what you think about all of the products that we are showcased today. 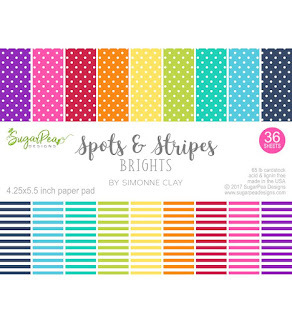 The SugarPea team has created some amazing and fun inspiration for you using the products featured here today. 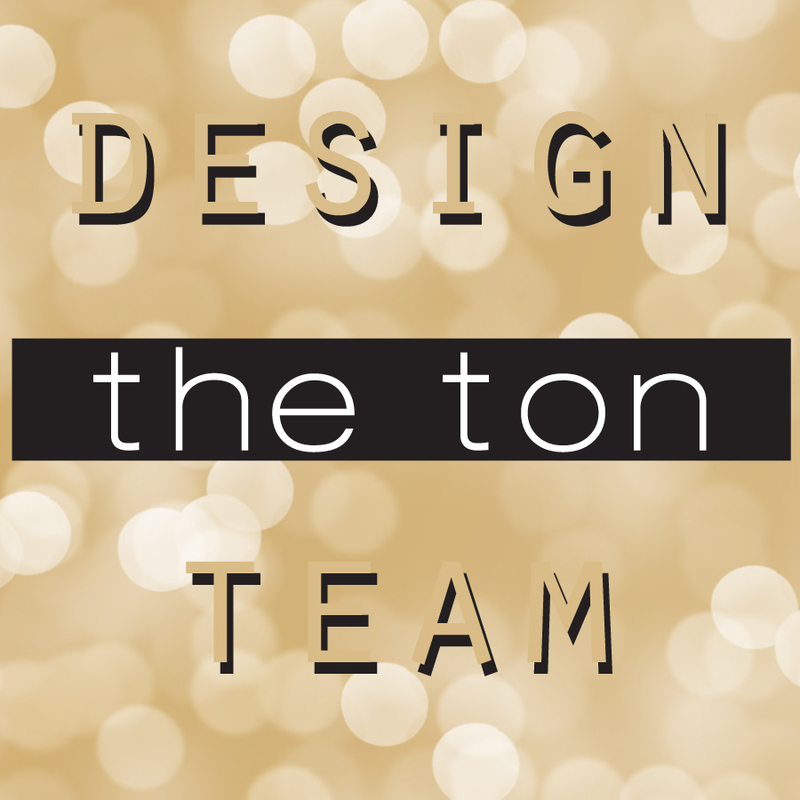 Please visit each of their blog below for details on their projects. And while you’re there be sure to leave a sweet comment for them, giving you an extra entry to win today’s giveaway prize.Thank you for stopping by here & may your day be a blessed one. 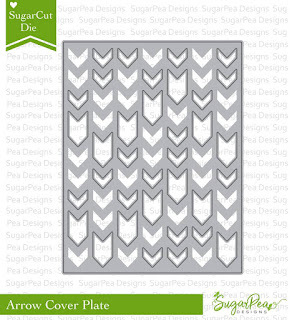 Hi peeps and welcome to day 1 of SugarPea Designs Fall Release. 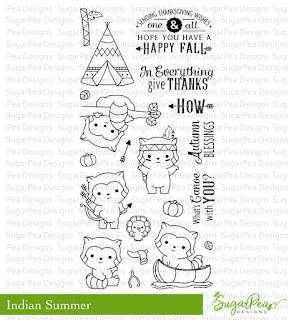 We have tons of fun goodies to introduce to you this week and we will start today a super cute set that's easily my favorite set of the release called Indian Summer. I made a fun shaker card for this li'l fella, cause I also want to showcase the fab Arrow Cover Plate. How cute is that raccoon? I think he's so darn adorable. And, the cover plate? Hm... hello, I kind of proud of this set since this was based on my idea. I am not good with the digital drawing, so basically I sent Wendy my rough sketch on paper and Chaitali made it come true. Did you see the embossing part of the plate? Thank you, Wendy & Chaitali for making my idea into real product! Here' a close up look of the card. I sure do love making shaker card. Below are some of the other products that also being introduced today. 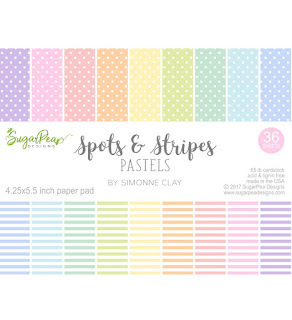 Here's a peek at them, including a couple fun patterned paper pads. Hi peeps! 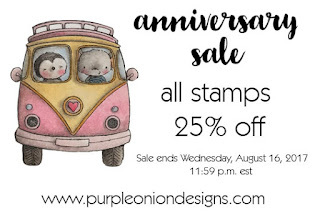 Just want to pop in to share Purple Onion Designs anniversary sale. All stamps 25% off. 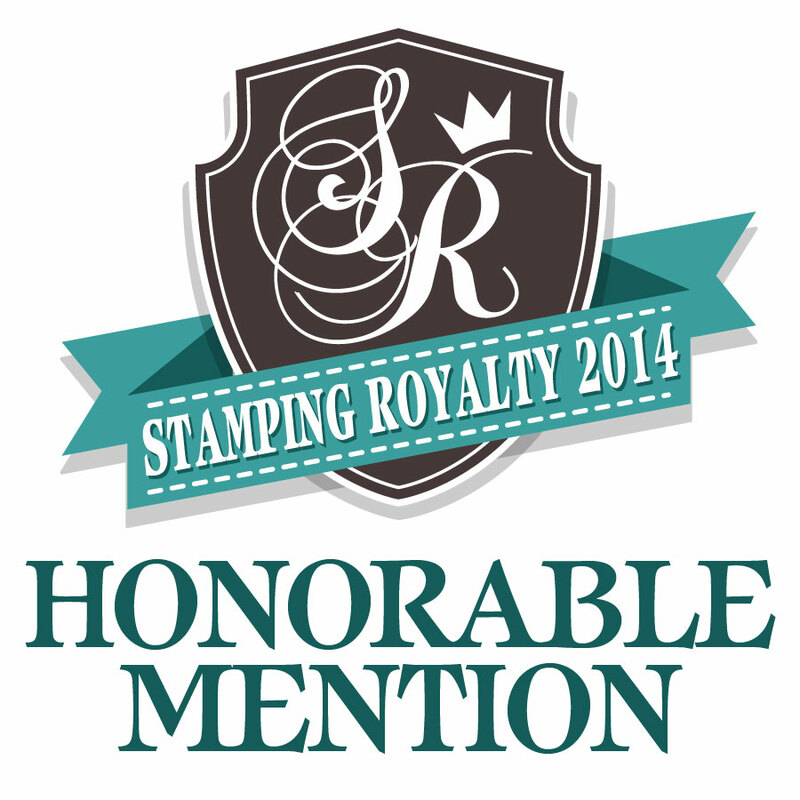 Woohooo.... time to stock up on your favorite stamp. :) The sale starts today till Wednesday, August 16, 2017. My favorite are of course the Stacey Yacula's collection. They're so cute & whimsical. I made this card to celebrate the anniversary. Head on to the SHOP so you can get the best selection. Sorry, for super short post. We're getting ready for our move. Moving day is tomorrow, I am in the middle of packing the house while also still working full time, so yeah it's been a bit crazy at my end. But, I see the light at the end of the tunnel! 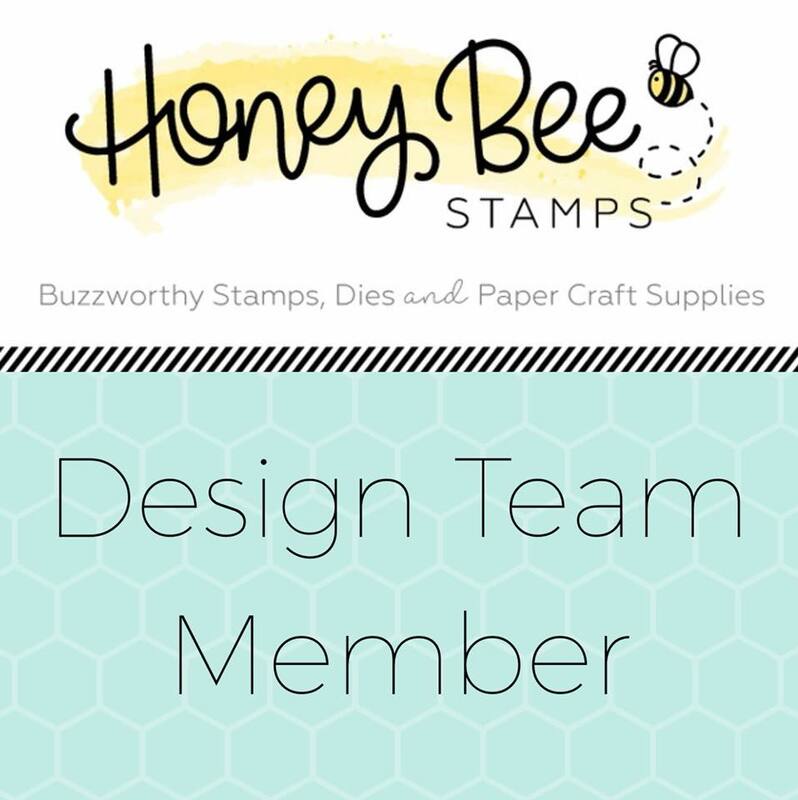 :) I'll be sharing my new craft zone once we settle in. Here's my card for the challenge inspired by the sketch. Come play along. You can enter your project HERE. Can't wait to see your creations! Hi peeps! It's been a bit quiet on my blog, isn't it. Well, we're getting closer to our moving date, so it's been a bit hectic between trying to get our current house ready for sale & finishing our new house. I literally almost passed out last week from exhaustion. I should know better, but when I set my mind to get things done, I just keep going till it's done and then boom... all out. Cross fingers hopefully everything goes well and we can really move in to our new house next week. 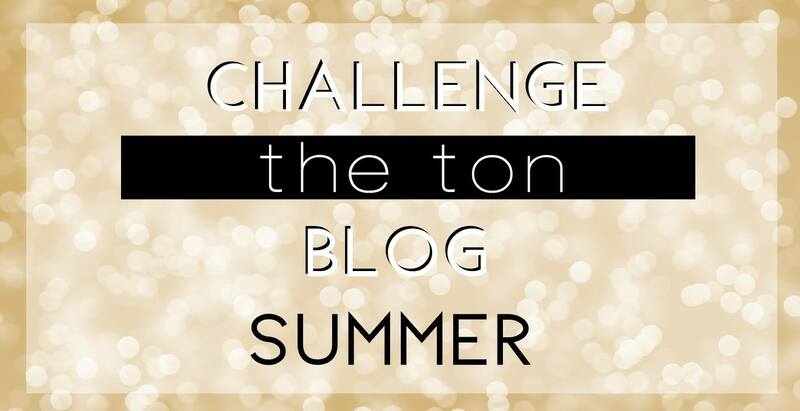 Anyway, new month it also means time for new challenge at The Ton Challenge blog. 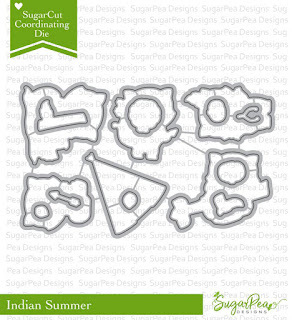 Thi smonth theme is summer and for me, summer means bright colors, so I created this Sunflower shaker card. For my card I used Fresh Cut Sunflowers Coordinating Outlines, Wishful Wildflowers, Fresh Cut Sunflowers Coordinating dies, Modern Labels dies, and Belle's Dress Couture Mix. Ah yes, can't forget the shimmer. Any flower card just looks better with some shimmer in my opinion. Well peeps, that's all from me today. Hope you will join us and play along. You can enter the challenge and find all the details HERE.